The W.W. Arcade building was first known as the Goodridge Block, constructed for Leonard A. Goodridge at 9696 Jasper Avenue during 1911 and 1912, and designed by architect Robert Percy Barnes. The ground floor at first housed a menswear store, barbershop, wine, liquor and cigar store, and pool hall, while the upper floors housed offices. The Goodridge Block stood at a prominent location at the northeast corner of Jasper Avenue and Namayo (97th Street), during the corner's last years as the principal commercial intersection of the city. In 1932 the main floor of the building was taken over by W.W. Sales Hardware, when Samuel P. Wilson purchased the property. 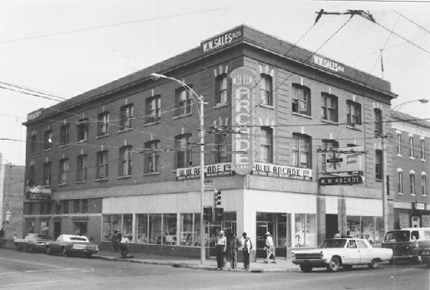 During the Second World War, its name was changed to W.W. Arcade by the new owners, the Ainsley brothers (Alex, Bob and Dave), and this name lasted from 1942 until March 1991, when the business moved out of the main floor of the building. The Edmonton Downtown Business Corporation received funding from the federal government to restore the Goodridge Block at the end of that year. The grand re-opening took place on April 15, 1993.